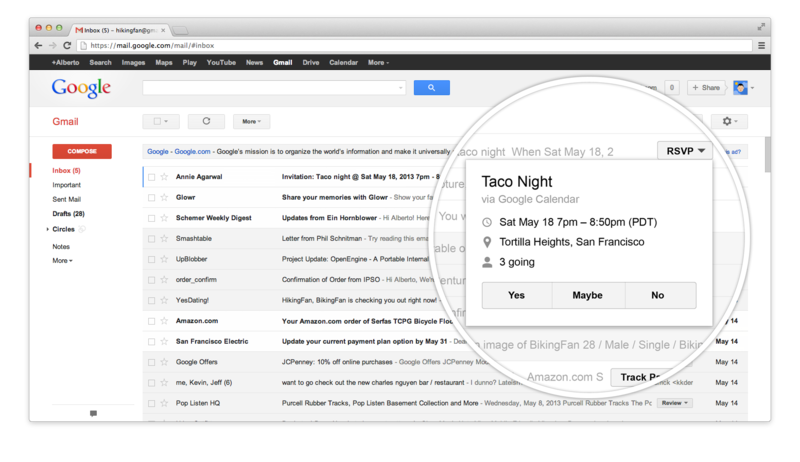 Google today announced a small but cool update to Gmail. For emails where the developer has enabled this feature, Google will now show action buttons next to emails in your inbox that let you take actions without even opening the message. The cool thing about this, however, is that it’s open to developers, who can now use the schema.org markup language to add their own actions to Gmail messages. Google says developers could, for example, use this for confirmation emails when somebody registers to a site, or they could present magazine subscribers with a one-click action to renew their subscriptions or review a product, movies, restaurants or services. Developers could also use this to augment flight confirmation emails and allow users to respond to a meeting invitation right from the inbox without ever opening the email. It’s important to note that the company has implemented a couple of security measures that should ensure that the user’s information remains safe. All actions, for example, have to be handled via HTTPS URLs, and hosts must have vaild SSL certificates. myERP, a popular all-in-one cloud-based business app for accounting, billing, project management and CRM, for example, has already implemented the buttons, and others will surely follow very soon.